Aquaventure Dive & Photo Center is a full-service PADI 5-Star Instructor Development Center (IDC) specializing in underwater photography and scuba instruction. Our full service photo department provides instruction and equipment consultation, and we have a retail center offering one of the largest selections of scuba gear and equipment service in the Midwest. Aquaventure’s travel department hosts between six and eight feature trips per year to variety of exotic destinations. Owners Steve and Jolene Philbrook are hands-on leaders who have built a team dedicated to providing personalized service to both new and seasoned divers. Steve owns Aquaventure Dive & Photo Center and oversees day-to-day operations. Steve has experience working in the underwater photo industry from shooting professionally, testing, repairing, and distributing for various manufacturers including INON America, Fisheye, and Watershot Inc. Steve enjoys both recreational and technical diving and is certified on various closed cicuit and semi-closed circuit rebreathers. 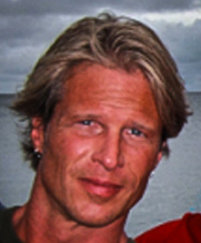 He is a PADI Master Scuba Diver Trainer, an SDI Instructor Trainer, as well as an IANTD & TDI Instructor. Steve’s passion for the underwater world is contagious and he enjoys inspiring others to dream big and seek adventure! View Steve & Jolene’s Photo Gallery. Steve’s wife, Jolene, also owns and manages Aquaventure Dive & Photo Center. She is passionate about diving and people. She loves kids and believes the sport of diving is for the entire family – children included! She organizes the kids programs as well as coordinates the many travel adventures Aquaventure offers. Jolene is a PADI & SDI Instructor and she is also a photography enthusiast. She previously managed INON America (UW photo equip distribution company). 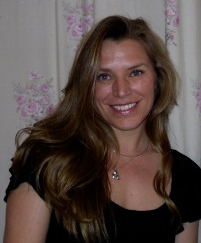 Jolene also has 14 years of corporate experience in the technology field and in management at a Fortune 100 company. She keeps the backoffice running smoothly at Aquaventure! Photo gear: Canon 70D, Nauticam NA-70D housing, INON strobes, and INON video lights. Ryan is a jack of all trades at Aquaventure. He is the store manager, PADI scuba instructor, and gas blender. 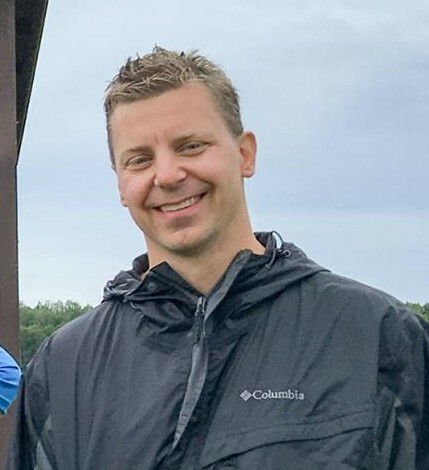 Ryan has been diving since 1993 and he enjoys traveling to Hawaii, Bahamas, Fiji, and Australia, but you can also find him diving locally in Crosby, Lake Wazee, Ore-be-gone, and the North Shore of Lake Superior. You can also find Ryan leading dive programs at the world’s largest aqaurium, SeaLife, in Mall of America. Ryan enjoys shooting underwater video and has a knack for capturing and creating fun and interesting videos for Aquaventure. 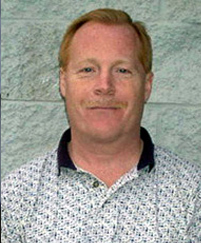 Gary was introduced to scuba in a high school gym class and immediately fell in love with scuba diving. 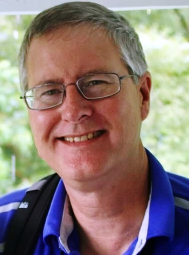 However, life took Gary in a different direction as he went on to explore his other great passion, architecture, and has worked in the profession for over thirty-one years. 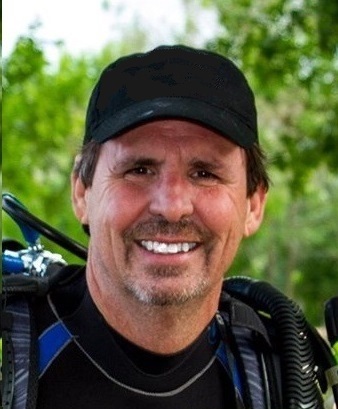 Gary is a retail specialist and a Master Scuba Diver Trainer at Aquaventure. The only thing Gary loves more than scuba diving is teaching scuba diving! He especially enjoys helping people who have anxieties about scuba diving and enjoys nothing better than to see the joy on his students’ faces when they come to embrace the underwater world and scuba. 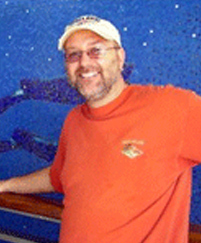 Gary enjoys leading Aquaventure-sponsored local fun dives and trips to exotic dive destinations. Gary enjoys diving in Minnesota and Wisconsin lakes and especially the Great Lake’s shipwreck diving…and even ice diving! For warm water destinations, some of Gary’s favorites spots are the Florida Keys, Cozumel, and Isla Mujeres because of the great diving, people, cultures (and food!). Scuba diving was something I have always wanted to experience. If you told me that I would one day become a Dive Master and diving would be something I’d be pursuing, I would have laughed in your face. I will never forget how I felt when I dove in for my first time: it was exhilarating, breathtaking, euphoric and fun. I became obsessed. It changed my life and I can’t imagine my life without it. My diving career began in June of 2016 in Cozumel where I got my Open Water One certification. Fast forward a year later to June of 2017, I started working the floor at ADPC, got my Advanced Open Water, Rescue and Dive Master certification. Not only has diving changed my life, but so has the ocean. They both contribute more meaning to my life. It’s opened my eyes up to a whole new world and it’s something I can give care too, the marine life that is. To protect it and spread awareness. The simplicity of the ocean and beautiful animals are compelling and sensational. Getting involved with diving has introduced me to some of the most amazing people. Diving brings in so many different people and I love expanding my horizons by meeting new people, hearing about their experiences with diving and gaining more knowledge. My next aspiration – Instructor! 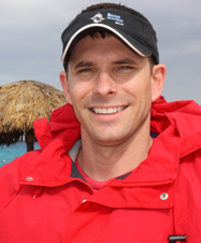 Erik is Aquaventure’s PADI Course Director and Training Director. Erik has been fascinated with the underwater world for as long as he can remember. He enjoys all things related to water – in it, on it, and especially beneath it! Erik enjoys teaching divers of all levels and abilities. Each level provides a different set of challenges and opportunities. Sharing this unique world with new divers is more than a passion – it is a transformation. Once someone gets salt water in their veins it will be there forever. Where is my favorite place to dive…diving is awesome everywhere you go because divers are awesome everywhere you go! His favorite part of diving is traveling to new locations, experiencing different cultures, and meeting new and exciting people. If you want to have fun traveling the world and diving in new places join me on one of Aquaventure group trips! 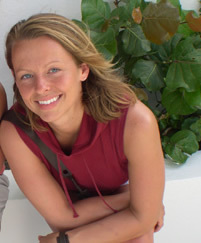 Melissa started diving in 2001, when she moved to Florida to study Marine Biology at the University of West Florida. Originally, she got certified at a NAUI dive shop near the Navy base in Pensacola to do marine biology research in the Wakatobi National Marine Park and Dry Tortugas while in school, and participated in the SCUBA Club at her University. While in the pan handle of Florida, Melissa dove many wrecks sunk between Pensacola, Florida and Gulf Shores, Alabama including battle ships, tug boats, fighter jets, and aircraft carriers. Her favorite dive location is at Operation Wallacea, a British run marine biology research station, in Southeastern Sulawesi, Indonesia. Over the years, Melissa has done research in the realm of fish physiology on the Common Mudskipper, Sand Flat Goby, Atlantic Stingray, Blue-Spotted Ribbontail Ray, Red Snapper, and many many species of juvenile bony fish. After diving for 10 years in various places around the world, Melissa decided to pursue her Dive Master under PADI. She continued her certifications until she obtained her Dive Master in 2012. Melissa was amazed that no matter how much diving you have done as an individual, you realize how much you DON’T know; when you move on to get your Dive Master! Melissa would encourage anyone to get their Dive Master; whether you desire to work as a dive professional, or you are looking to increase your knowledge-base and safety, you will find the Dive Master Program to be extremely rewarding, challenging, and fun! Ben “Captain America” Moore is one of our equipment service technicians as well as a photography expert here at Aquaventure. His passion is macro photography. Ben can be seen laying in the muck playing with all sorts of little creatures! He enjoys all kinds of diving, recreational and technical. 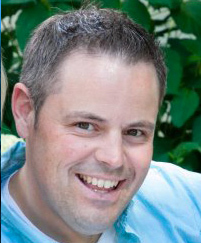 Mike is a project manager for an engineering/construction firm full time and an avid diver. While diving for the past eleven years, he has progressed through many specialty training classes including PADI and SDI Scuba Instructor. “I became an instructor because I enjoy introducing people to my passion of scuba diving.” Mike’s favorite local diving is on the shipwrecks of Isle Royale. “I can’t get enough of diving in Isle Royal. Every time I dive on a wreck I always see something different. Not only are the wrecks pristine, but the island itself is beautiful to explore.” During the winter months you can find Mike enjoying a week or two diving in some exotic location. He has dove throughout the Caribbean, the kelp forests of California, Truk Lagoon and Palau. Where will you see him next? In class or the Galapagos Islands! Mark is a PADI Master Scuba Diver Trainer. He enjoys all that our local diving has to offer. From the city lakes to central Minnesota’s mine pits to the great lakes. Mark has experience in all of them. His favorite warm water destinations are Palau and the Bahamas where he leads groups of high schoolers on science based liveaboard trips. Jamie is a dentist and owner of Arbor Lakes Dental. Her other passion is scuba diving. She was originally certified to dive as a young adult but did not have the opportunity to dive as much as she wanted to. In 2012 a dear family friend asked her to dive with him in Belize. Because it had been so many years since Jamie had been diving, she felt she should refresh her knowledge and skills. The instructors at Aquaventure immediately revived her excitement and love for diving. Jamie is now a PADI scuba instructor and shares her passion of diving with people of all ages. When asked where her favorite place to dive is, she will answer, “Every Where!”. Whether it is the pond behind her office or Belize, there are always great things to see under water. 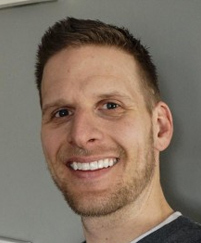 Drew is a financial consultant and part-time fireman as well as a PADI scuba instructor. 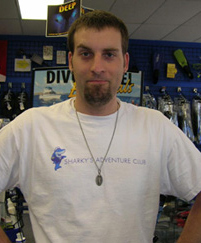 Besides his passion for local diving, Drew has lead trips for Aquaventure to Roatan and Bonaire. 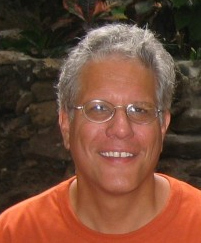 He also enjoys tech diving the great lakes shipwrecks and lobster hunting in the Florida Keys. 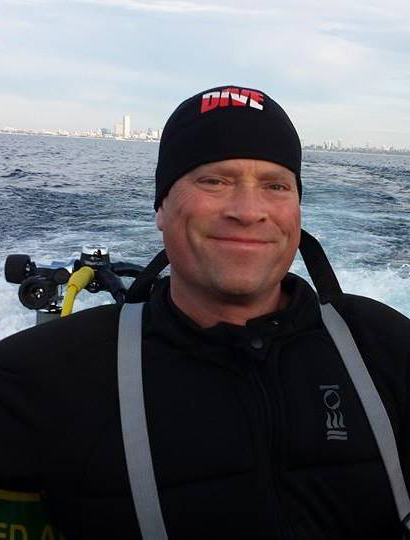 Drew is certified in adaptive scuba instruction – helping handicapped divers make their dreams come true! You can find Drew in the school systems informing and teaching elementary kids about the ocean and getting them excited about diving! Gene Milne is a PADI Instructor. 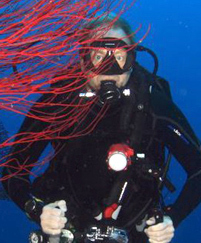 Gene’s passion for diving dates back to over 30 years ago when he was in his early 20’s. Gene and his high school best bud, found themselves in Hawaii looking for adventure, by sheer luck they happened to stumble across a local dive shop offering Discover Scuba diving classes. Little did he know then, but that class would set him up for a lifetime of diving pleasure. When Gene’s not diving you’ll find him enjoying camping with his wife, Jodi, in their home built teardrop trailer, or out on a photo safari exploring the true beauty of Minnesota. Gene’s other passion in life is wood working, where he has become an accomplished luthier and truly enjoys watching instruments that he has created being played. Some may call him an over achiever “Jamie Sledd”, but others know he just loves making the most out of each day. Gene spends his 9-5 as a IT Manager for a national retailer, where his has worked for the past 30 plus years. 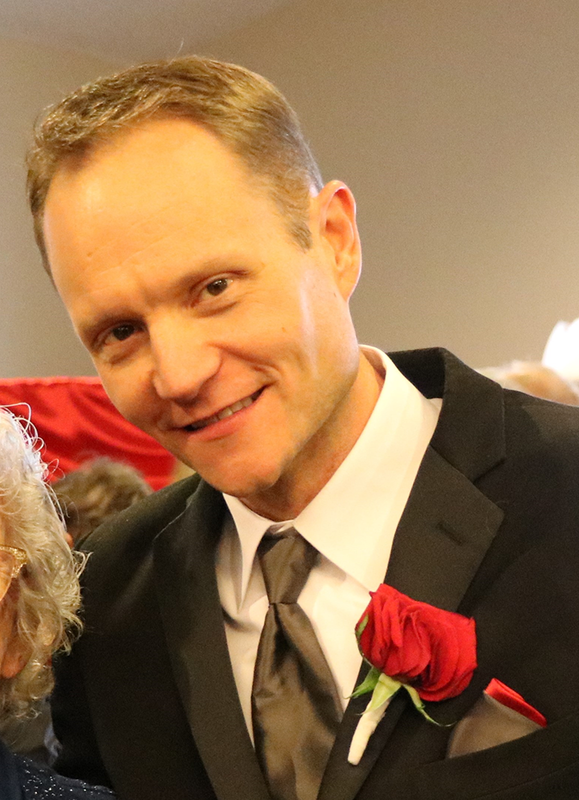 In recent years Gene has discovered his passion for teaching, his road from Open water Diver to Dive Instructor has truly opened his eyes to the heartfelt pleasure of helping others achieve their goals. Adam is an Instructor with Aquaventure. He has been diving since 2004 when he convinced his wife to get certified with him to fulfill a lifelong goal. Adam enjoys introducing and teaching new divers to his favorite pastime, as well as helping certified divers gain confidence through diving experiences and specialty training courses. In his spare-time he enjoys diving local lakes, the Cuyuna mine pits, and Great Lakes shipwrecks. His favorite distant dive experiences include Resurrection Bay Alaska, diving with the manta rays in Hawaii, and diving with his wife and three kids anywhere! One day he hopes to dive the Red Sea. Jeff is a letter carrier with the USPS, but his passion is diving. He was Open Water certified in 2011. Two years later he became a Dive Master and is now a PADI Instructor! “I was originally intimidated by the sport but the staff at Aquaventure not only made it easy but made the learning fun. I’ve enjoyed every class I’ve taken, but the Dive Master course was my favorite”. “I love both cold water and warm water diving. I’ve never had a bad dive trip, but if I were to pick a few favorites it would be shipwreck diving in the Straights of Mackinaw, drift diving in Cozumel and shore diving in Curacao”. Equipment: Suunto Zoop computer; Aqualung Titan LX Regulator; Aqualung Pro LT BCD; DUI TLS 350 Dry Suit. Brittany is a dive master at Aquaventure Dive & Photo Center. She has been diving since 2015. On a whim, she decided to give scuba diving a try while on holiday with her sisters in Moalboal, Cebu, Philippines. She was apprehensive about diving at first, but she is very glad that she put her fears aside and decided to try it anyway. She took great interest in the adventurous aspect of scuba diving, and upon returning to the U.S., researched locations to dive locally. She continued fun diving, and receiving instruction in Minnesota, taking great interest in scuba travel. She enjoys learning about new dive techniques, and meeting people who are eager to share their scuba experiences through story telling. 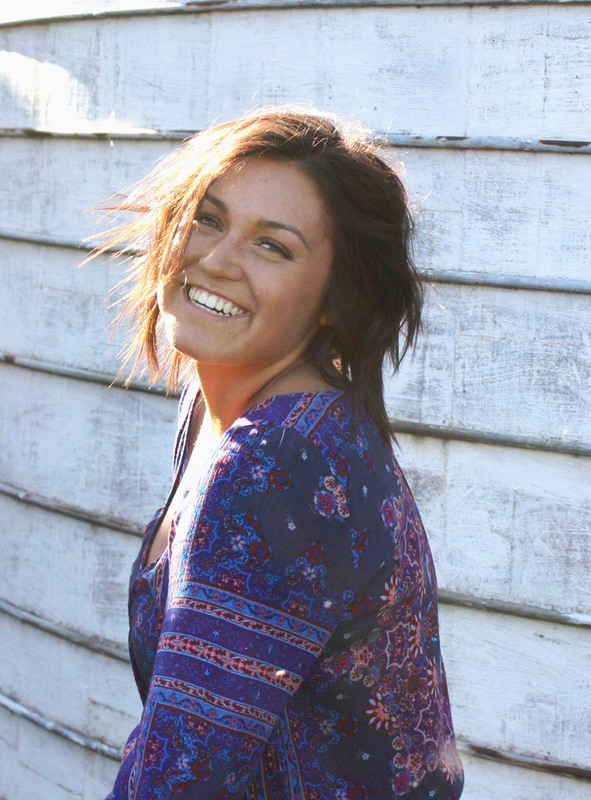 Whether it’s in the Caribbean, Southeast Asia, or locally, Brittany enjoys diving. She can often be seen diving in the Cuyuna mine pits as well as other lakes throughout the area. She enjoys interacting with the underwater world, and the tranquility that comes with gliding through the water at ease. She suggests to those who are feeling a bit apprehensive, about diving, to try it anyway. She mentions that you’ll never know how much you’ll enjoy something until you attempt it! Brittany also believes that one of the best ways to meet new dive buddies is to get involved in your local scuba diving community, either by enrolling in a scuba class or by participating in fun dives with a dive shop. 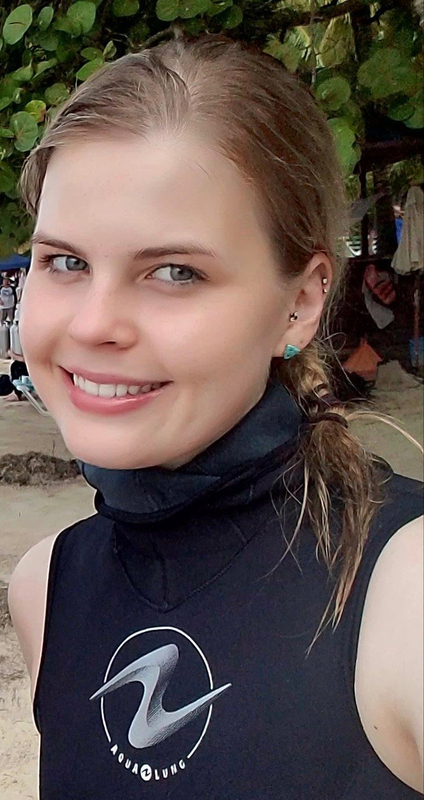 She is very happy that she decided to pursue scuba diving, and she hopes to continue to learn more about it as well as to share the rewarding aspects of diving with others in the future. Brad started diving in 2001 when his daughter, 14 at the time, decided she wanted to be a marine biologist so diving lessons were her Christmas present and dad joined in. Since then Brad has balanced diving and a business career and started a dive club where he worked. With the start of the dive club and group dives, he quickly saw the value of further education and became a Dive Master in 2013. Along with Dive Master work, he also is part of the Tootsie Pop divers trip and enjoys the yearly trips for great diving. After a 20 year career in Business Administration and Office Management, Kathy decided to pursue more of her hobbies and personal interests. 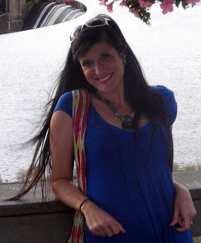 Kathy is a Master Scuba Diver Trainer and has been a professional at Aquaventure since 2009. She works with students of all ages – including teaching the youngest of our students in the Seal Team. If she isn’t teaching students, she might be found helping customers around the shop. When she started diving in 2007, Kathy hoped to overcome some apprehension of mysterious ‘things lurking beneath the surface’ that she couldn’t see – especially sharks. In 2010 she took a position as a safety diver at Sea Life Aquarium at the Mall of America conducting dive programs in the main shark exhibit. Kathy eventually became the lead safety diver at Sea Life, providing staff training and overseeing maintenance dives and hand-feeding of many of the animals, including some of the smaller sharks. Kathy is also a staff Instructor for the Boy Scouts of America High Adventure Seabase in Islamorada, Florida throughout the year. Kathy is absolutely amazed at the magnificent creatures to be seen in both fresh and salt water environments. Her joy for diving evolved into a deep desire to inspire and encourage others to explore the beauty and fragility of aquatic life, and personally assist and teach divers in the development of their own skills and confidence in the underwater world. Kathy values greatly the opportunity to help educate and work with anxious or apprehensive students of all ages to overcome their fears and concerns in the diving environment. 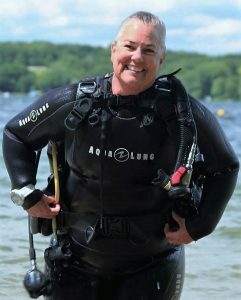 No matter where she’s diving in the world – Kathy is always willing to share her passion for diving and encourage others to experience the indescribable sense of peace and tranquility of Scuba diving. Brett is Dive Master at Aquaventure and works in the engineering department for Firestone. In 1998 he joined the Navy and was encouraged to take a Discover Scuba while stationed in Pearl Harbor, HI. Originally, he had no desire to go in or near the ocean, but his thoughts quickly changed and for the next three years he dove all around the island of Oahu. His favorite dive was a dive site called three tables. It consists of three lava formations that a diver walks on while trying to avoid the sea urchins. In 2008, he took a trip to Cozumel with Mike Daust and soon after he became a Dive Master. He enjoys diving with his wife and video editing in his spare time. Rob is a computer programmer by day and a scuba diver, well, whenever he gets the chance! 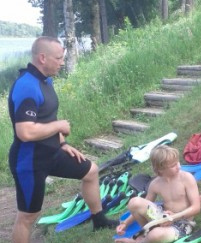 He has been diving for several years now and remembers his first dive vividly. “I remember the joy and excitement from that first dive and being immediately hooked. What I love most about being a Dive Master with Aquaventure is seeing that same joy and excitement with others when they experience their first dive”. Whether it is the local pits / lakes or the Caribbean, Rob loves to dive pretty much anywhere. His favorite dive so far is drift diving in Cozumel. His wife and 2 sons are all certified and enjoy diving together as a family.